Thursday's NBA on TNT regular season doubleheader coverage will feature both of the three-time reigning conference champions – Golden State Warriors & Cleveland Cavaliers – in action on Thursday, Dec. 14. In the night's first game, the Cavs and LeBron James will take on the up-and-coming Los Angeles Lakers and rookie playmaker Lonzo Ball at 8 p.m. ET (TNT's game telecast is not available locally in Cleveland), followed by the Warriors and Kevin Durant hosting the Dallas Mavericks and Dirk Nowitzki at 10:30 p.m. (game telecast not available locally in Golden State). Basketball legends and Naismith Basketball Hall of Famers Oscar Robertson (Class of 1980), Julius Erving (1993), George Gervin (1996), Bernard King (2013) and Lisa Leslie (2015) will join Kevin Garnett in Area 21 throughout TNT's Thursday NBA coverage, with additional content running on Facebook and Twitter. 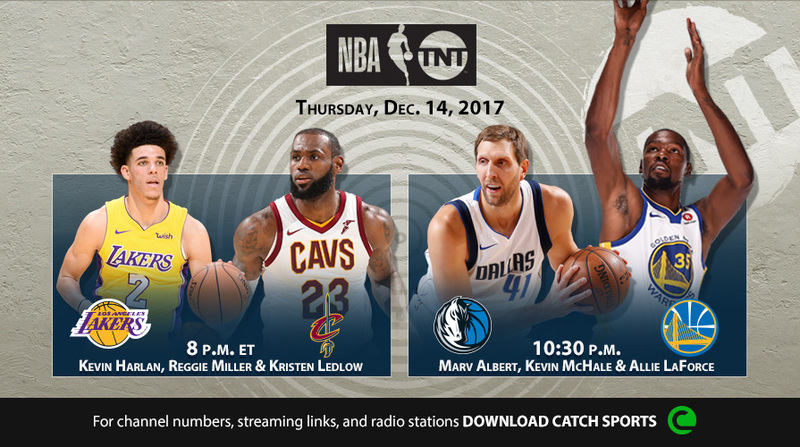 Additionally, for the first time, TNT commentators Reggie Miller, Kevin Harlan and Kristen Ledlow will give fans a behind-the-scenes look at Thursday's telecast preparation from their perspectives via a full social takeover from Cleveland, with live content available on the NBA on TNT's Facebook, Twitter and Instagram handles. • Harlan (play-by-play), Miller (analyst) & Ledlow (reporter) will call the Lakers vs. Cavaliers telecast at 8 p.m., with corresponding social media takeover content on the NBA on TNT's Facebook, Twitter & Instagram handles throughout the day. • Marv Albert will provide play-by-play for Mavericks vs. Warriors, alongside analyst Kevin McHale and reporter Allie LaForce at 10:30 p.m.